Database Systems Corp. (DSC) can call church members using automated phone dialers that broadcast a single message to all or selected members of a church. DSC has been providing software products and computer technology since 1978 and specializes in computer phone technology. DSC has developed products such as voice broadcasting systems which are used to send automatic phone reminders. Maintaining contact with members of a church or synagogue is now a much easier task when using our church reminder calling services. Church call reminders and announcements such as weddings and funerals can be automatically broadcast to all or part of your congregation with the same, consistent message using our automatic phone message broadcasting system. Reminders can be sent immediately to all of your congregation so that important events such as funerals or meetings can be broadcast to everyone at once. Your church announcement can be recorded over the phone using our 800 number service. Reminder notices can likewise be recorded on your own computer and download to our system over the internet. You can likewise maintain any number of contact lists of members who are to receive messages. Simply use our internet administrative page to designate the message and the list and push the start button. Contact DSC to learn more about our voice broadcast outsourcing including church reminder calling services. 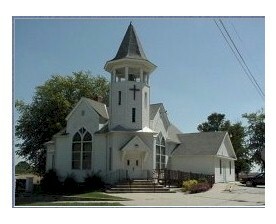 "Chambersburg Christian Church was established in 1850. The present building (pictured) was dedicated in 1901 and has since undergone several renovations and additions." The Chambersburg Christian Church uses our church reminder and announcement services to send automatic call reminders to its membership. These phone messages focus on the upcoming events including church gatherings and funeral announcements. 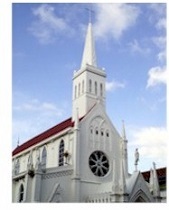 Sending church reminders using automatic phone dialers is becoming very popular and affordable these days. Instead of relying on word of mouth or publications which are quickly out of date and expensive, automatic phone messaging lets you contact your congregration instantly! Here are just a few of the benefits and applications for this economical service.